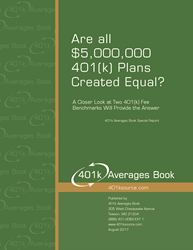 401k Averages Book's new report finds there can be significant pricing differences if a $5,000,000 401k plan has 100 participants as opposed to 500 participants. The reasonability test begins by understanding the range, what’s high and low, and what does the average or median look like. According to Are All $5,000,000 401(k) Plans Created Equal?, a new report published by the authors of 401k Averages Book, the size of a 401k plan’s average participant account balance will influence the amount of fees they pay. “Our findings indicate the importance of matching your plan’s fee benchmark to one that closely represents your plan’s average account balance, number of participants, and total assets,” said David W. Huntley co-author of the 401k Averages Book. One of the biggest drivers of a 401k plan’s fee is the size of its average account balance. There can be significant pricing differences if the $5,000,000 401k plan has 100 participants as opposed to 500 participants. According to the findings, the total bundled cost for a plan with 100 participants and an average account balance of $50,000 is 1.25 percent as compared to 1.56 percent for a 500-participant plan with an average account balance of $10,000. Even when the benchmark universe reflects the appropriate average account balance, the report illustrates the wide range that exists between the low and high cost providers. A detailed copy of the full report is available at http://www.401ksource.com/special-report.